JP Morgan (JPM), Wells Fargo (WFC) and PNC Bank (PNC) kickoff Q1, 2019 SP 500 earnings tomorrow, and then next week another 50 – 60 companies across the 11 SP 500 sectors report their Q1 ’19 results. However, Financials usually lead off the earnings reports and usually complete their earnings releases before the end of the month. Clients own JP Morgan as a top 5 holding, and own WFC through the XLF, and PNC through the KRE. Financials have been under-performing for 15 months now, with the sector returning just 8.6% in Q1 ’19 versus the SP 500’s +13.6%. The metrics that jumped out to me were the “correlation to Treasury yields” and the P/E ratio’s relative to longer-term averages. Schwab (where client assets are custodied) does some good research led by LizAnn Sonders and her crew. Brad Sorenson, a member of that Schwab group, published this piece today on Financials and the yield curve wondering out loud whether Financials were a Value or a Value Trap, and I do think it’s the right question. JP Morgan with its wide business model scope covers traditional corporate banking, the capital markets and the consumer. In the 4th quarter of ’18, JPM missed on the consensus EPS estimate by 10% (that’s a lot), printing $1.98 in EPS versus the $2.19 consensus with a lot of it due to expense growth, which is also expected to be up mid-single-digits in Q1 ’19. The good news around the Q4 ’18 release was that consumer credit continues to perform very well, and given the low 200k jobless claims data released today and the healthy non-farm payroll report, US consumer balance sheets should remain in very good shape. JPM per consensus on Friday morning, April 12th, 2019, is expected to report $2.35 in EPS on $28.4 billion in revenue for expected y/y growth of -1% and +2%. With the way the credit and equity markets performed in Q1 ’19, you would think the capital markets and the investment management businesses will show strong results for Q1 ’19. Wells Fargo no longer interests me as an individual holding since I consider it to be a damaged brand. And the regional banks are often commodity-like businesses enough to warrant the investment in the ETF, without trying to pick individual stocks. Summary / Conclusion: Financials will lap the tax cuts from the first two quarters of 2018, so y/y growth will look below-average, but the sector is out-of-favor from a sentiment perspective, and the valuations are quite reasonable. To answer the Brad Sorenson question, I do think there is more “value” in Financials than risk today, but I also think the long-end of the curve, particularly the 10-year Treasury yield has to rise back towards the 2.75% – 3% range, to get rid of this “inversion” fear. A trade for JPM above the 200-day moving average at $107.57 should take the stock back towards the 2018 highs near $115 – $120. 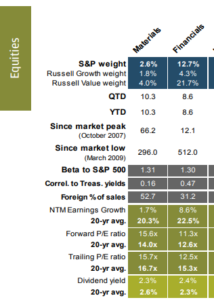 While JPM is richly-valued on a book value and tangible book basis, on an earnings basis (see the above table and the longer-term PE averages), the stock looks 15% – 20% undervalued.